Land Homes Design and Build Seminar – The Importance of Site Selection, Geotech report. Whether you are contemplating building, planning a massive renovation/add on, actively working with an Architect or have your concept plans already drawn up, this seminar series is for you. When it comes to building, your dream home or dream investment portfolio there is a lot of key factors and decisions that go into designing and building an Architecturally designed house. 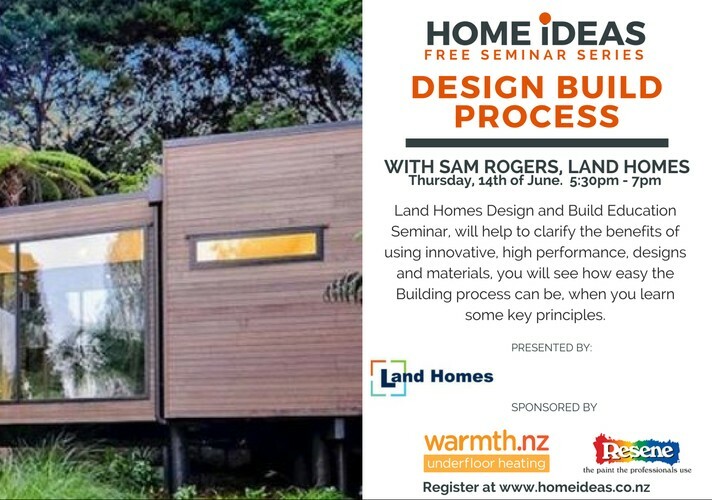 Land Homes Design and Build Education Seminar, will help to clarify the benefits of using innovative, high performance, designs and materials, you will see how easy the Building process can be, when you learn some key principles. - Buy or Build, what’s right for you. - The importance of Site selection, the good the bad and the ugly. - How to create the best floor plans from the start. Design and Build education, is very important to us as we believe in actively putting our clients in the driver’s seat of their own build. Through innovative High Performance Materials and design knowledge our clients can make informed choices. High performance by design for the best price. Land Homes Building your Future. Join us for complimentary refreshments with free parking onsite. Unfortunately due to the seminar room accessed via one flight of stairs, the venue is not suitable for those with mobility issues.